Ductless heating and cooling units are fast becoming the most versatile and affordable solution for Maryland homes in the summer. They are perfect for garages, basements, attics, or older homes. Since they don’t require the costly and sometimes unsightly installation of ductwork throughout your home, people in Baltimore are choosing ductless units more and more to supplement their existing heating and cooling system. And because they are so versatile; some people even use them as their primary heating and cooling system! Do Ductless Systems Need Maintenance? Ductless or mini-split systems have a lot of differences from traditional heating and cooling units, but one thing that doesn’t change is its need for maintenance. A lot of places offer maintenance for your ductless unit, but what if you want to save money and make it hassle-free by purchasing a plan? Well, we thought the same thing. 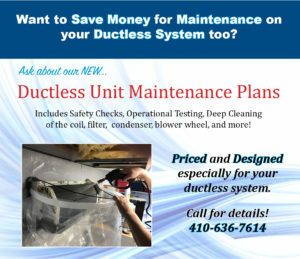 So we’ve designed a bi-annual maintenance specifically for your ductless unit. Since your traditional and ductless unit aren’t designed the same, they shouldn’t be cleaned the same. 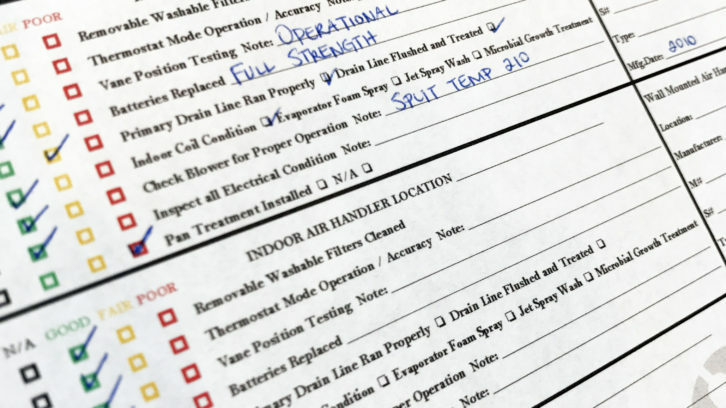 We’ve been testing the best tools and products in the industry to give you the cleanest and highest functioning unit possible. Included in our maintenance is a deep flush cleaning that gets rid of all the mildew, build up, and funky smells that collects on your coil. We also clean the filter, housing, blower wheel, outside condenser, and more. So if you don’t want to pay an annual price for your ductless unit maintenance, and would like to save money by becoming a plan member, call one of our friendly Client Care Representatives and we’ll be happy to tell you more!